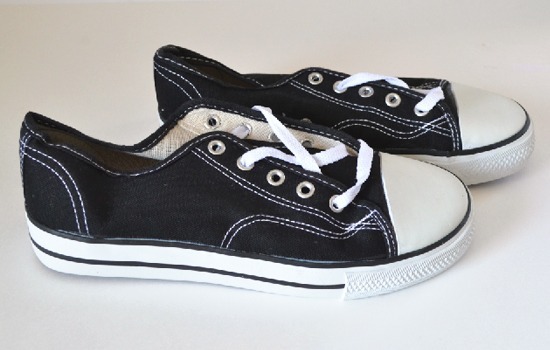 I was perusing the world cheapie shoes on online when an idea so fantastic struck me. 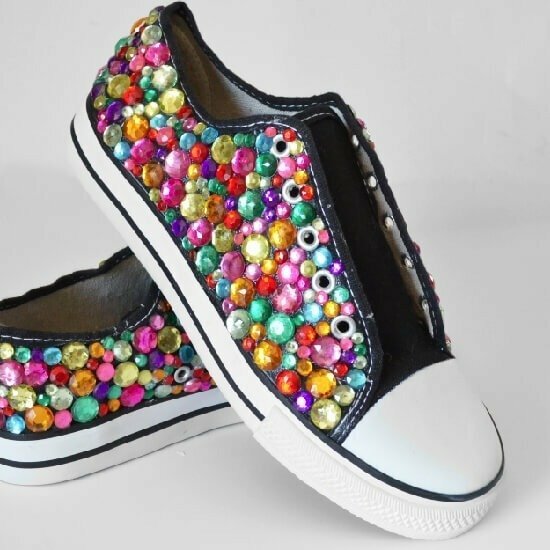 Without a doubt, if I made a pair of chucks style rhinestone sneakers for my sister that were bejeweled within an inch of being too heavy to comfortably wear, well, she’d be the happiest sister in the world. So I texted and asked the important question. 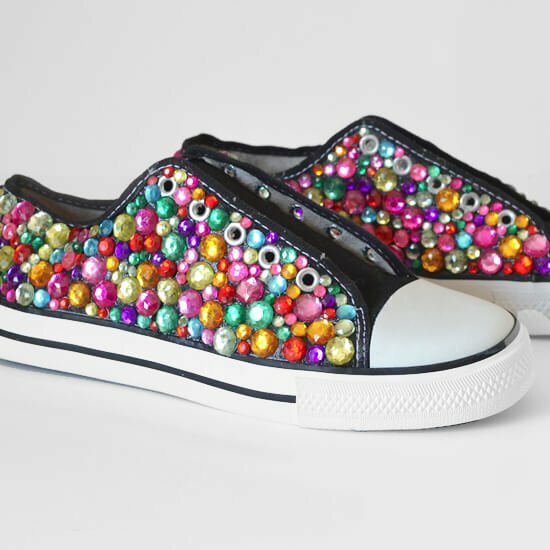 Would you wear a pair of converse chuck style shoes covered in multi-colored rhinestones? And as suspected, she was totally down. Totally. 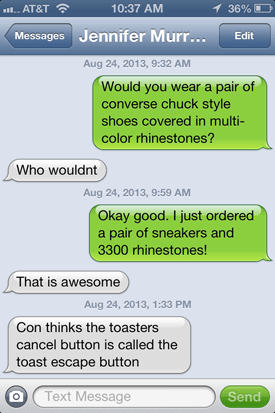 So I ordered up the sneakers and then a boatload or rhinestones. But when they arrived they were tiny. Egads I’ve been done in AGAIN by those stupid little millimeters! They were just so tiny that it wasn’t going to work. So Russell got to stop by Hobby Lobby on the way home for a one pound bucket of multi-colored bling. And I got to gluing them down. It took quite a bit more trial and effort than I had anticipated, but in the end it worked out really well. Here are the sneakers before. Simple, brand new, and smelling like a tire factory. If ordering a pair online you may want to air them out for a few days. Whew! I first started using an industrial strength glue but two things happened. I glued several rhinestones to myself and it really hurt removing them. The silver on the back of the stones was cracking in an unsightly way. 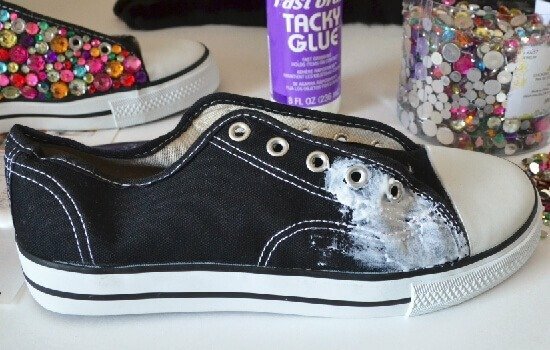 Smear the glue in a small area. I just used my finger most of the time, but sometimes I used a brush. If using a brush, keep water available and drop the brush in after every use. This will prevent the glue from drying in your brush and ruining it. Apply stones to the wet glue, jamming them as close together as possible. Work in small areas. If the canvas bends too much while gluing the stones might fall off or glue on in a less that flush way. To keep moving without messing up, I swapped sides, swapping shoes each pass. Bam! 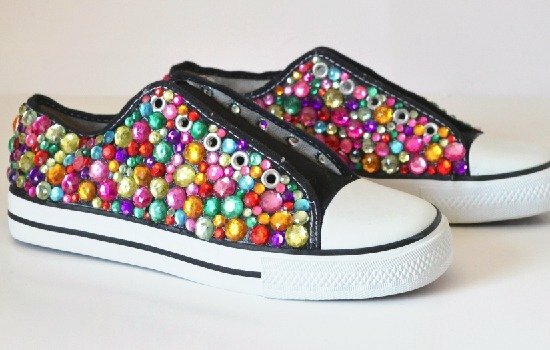 Can you believe the glitzy goodness these shoes became? They’re now a quarter pound heavier than they were before, which makes them a great work out! I texted a pic to my sister the second they were done. I’m happy to let you know that she totally approves. 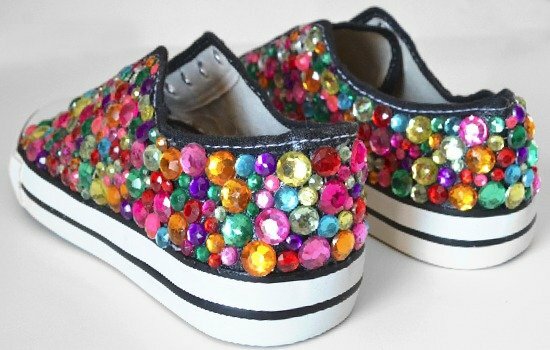 So if you covet the little girl’s shoes you’ve seen, grab some shoes and glue some rhinestones on them! 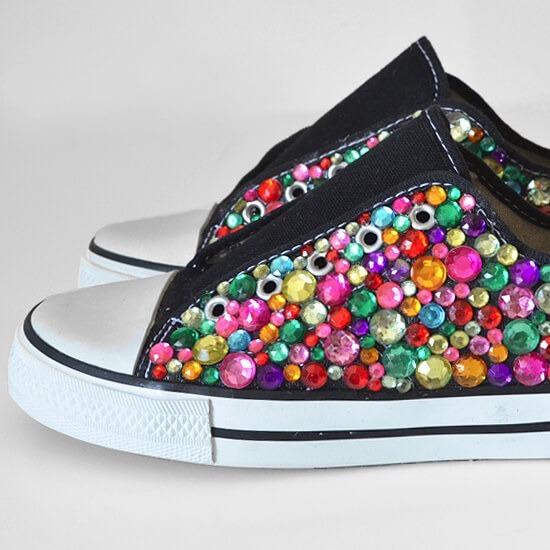 Because as far as I’m concerned, you’re never too old to rock some rhinestone sneakers! While not my personal style, those are pretty freaking awesome. I kinda want to do that to a pair of cheap heels now. I know EXACTLY what you mean! I love the glitz but these are just a bit too much for me. But then again, I find myself wandering over and eyeballing them and wondering if I need to make a second pair for my sister and keep these! How cute are these?? You are amazing! 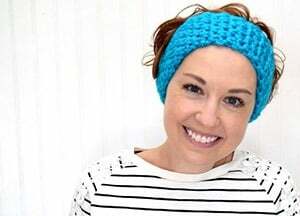 Thanks for sharing at Tickled Pink Times Two! Make it a pink day! Thanks so much. It was a pleasure joining your party! My daughter would love that! 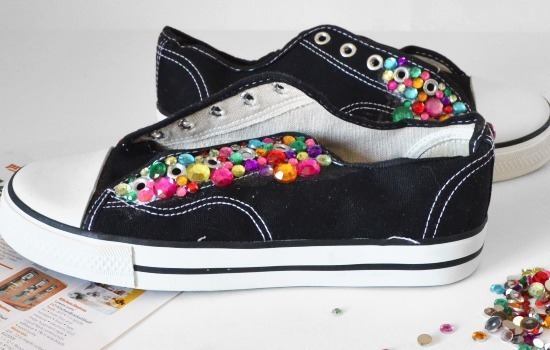 You have inspired me to create some “BLINGED” out sneakers for an outside church event…. The attire is relaxed Summer white….so I plan to create A little Sunday BLING with a twist! !